Well you knew it was coming right? Yes Zhucheng does now meature a mounted Zhuchengtyrannus. Or rather inevitably, more accurately, it features a T. rex mount with the maxilla and dentary replaced with cases of the holotype. This is quite clear on the photos below as the added parts are of rather better quality and have been pained a little differently too. OK, so otherwise this is basically just another rex mount but forgive me for liking it. And it is in the process of absolutely mashing a juvenile Shantungosaurus, so what’s not to like? Being the first artist to illustrate a new species of extinct animal is a great honour. The series of events that are required to successfully fossilise a dinosaur and for that individual to be revealed to the world millions of years after death is an epic story. 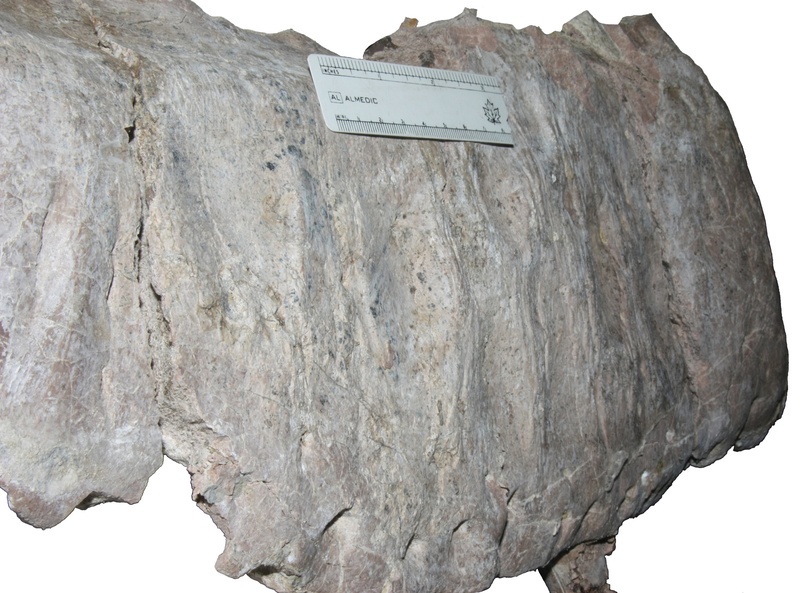 In brief, the dinosaur first died in a location where its remains were covered by sediment rapidly. The animal’s remains then hid within the Earth and lay undisturbed for a length of time we cannot imagine. During this vast period the dead creature’s species will evolve out of existence and new life forms will survive catastrophes to colonize our planet. Eventually a species of energy hungry ape developed an interest in investigating planet Earth’s history and against the odds our fossilised dinosaur was discovered. 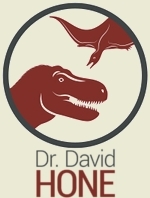 One of the apes, let’s call him Dave Hone, then decided to reveal the dinosaur to his entire ape species and asked a friend, let’s call him Bob Nicholls, to illustrate the wonderful discovery. It may sound like a simple tale, but if you really think about it, it is astonishing. To be a small part of it makes the hair on the back of my neck stand up. There is no greater honour for a palaeontologist than to be the first to show the world what a long extinct animal looked like. Especially a tyrannosaur! 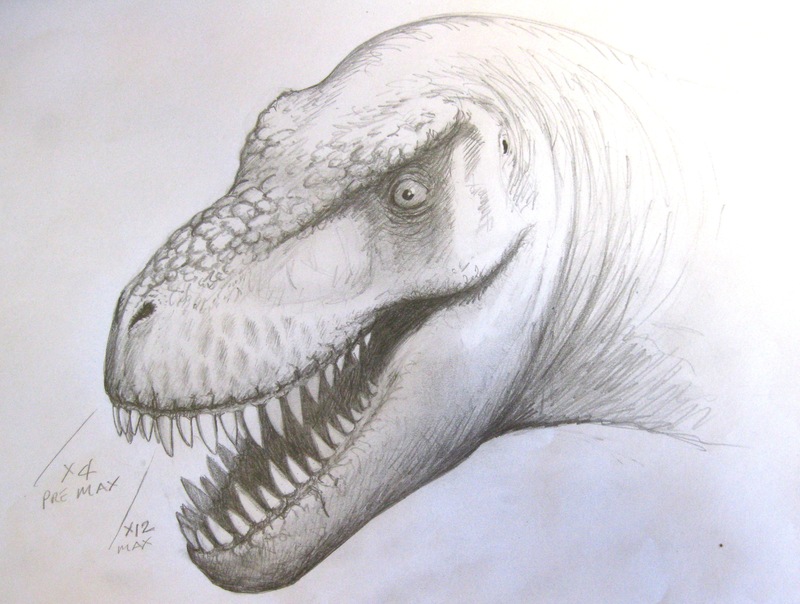 Sketch for the life reconstruction of Zhuchengtyrannus. Courtesy of Bob Nicholls. The illustration of Zhuchengtyrannus took me about eight hours in total, from the first preliminary drawing to e-mail delivery. The first sketch was a satisfactory pose but four re-draws were required to make small adjustments to the teeth, snout, nostril and eye. When Dave was happy for me to render the colour artwork I painted it with acrylic paint on illustration card. 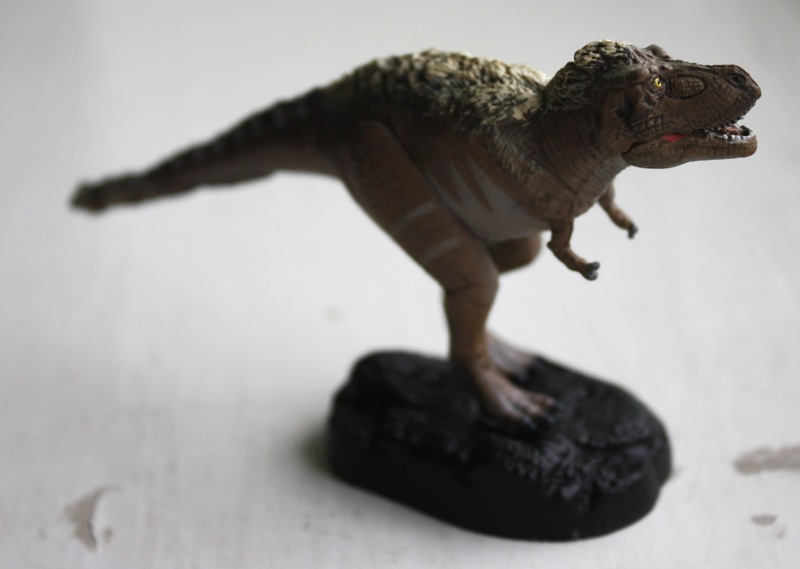 I chose to paint the colour scheme of a show-off male with an eye stripe and blood red patches for impressing the tyrannosaur ladies. I wish Dave and I could have worked on the piece a little longer but it was an excellent and most enjoyable day’s work. Zhuchengtyrannus is dead, long live Zhuchengtyrannus! Yeah, this is still creeping along. I’m trying to stop honest and while I’m sure I’ve lost most people by now, this is more or less the end of it. (More or less because there are ZT related things to come but which won’t actually really mention the damned beast itself so from here you’re basically safe). This has, understandably, been a hectic week and I’ve still got bits of work to do related to this so I’m not quite done, even if the blog is. Going all the way back to the Eeeek! post, I want to again thank people for being helpful and not jumping me with ZT appearing all over the web before we were ready. It is much appreciated and helped us get maximum impact with the media. On that note, I’ve yet to put up this link to the University College Dublin page where there are links to a great many of the online media about Zhuchengtyrannus including a video of me talking about it. If you’re not interested in hearing me say things you’ve already heard or read 50 times over on here then you can try and identify all the various dinosaur and pterosaur books on the shelf behind me. Fun for all the family (possibly). And while I’m here, here’s links to all the previous posts on here introducing this guy, notes on the taxonomy, ecology, size, and artwork. 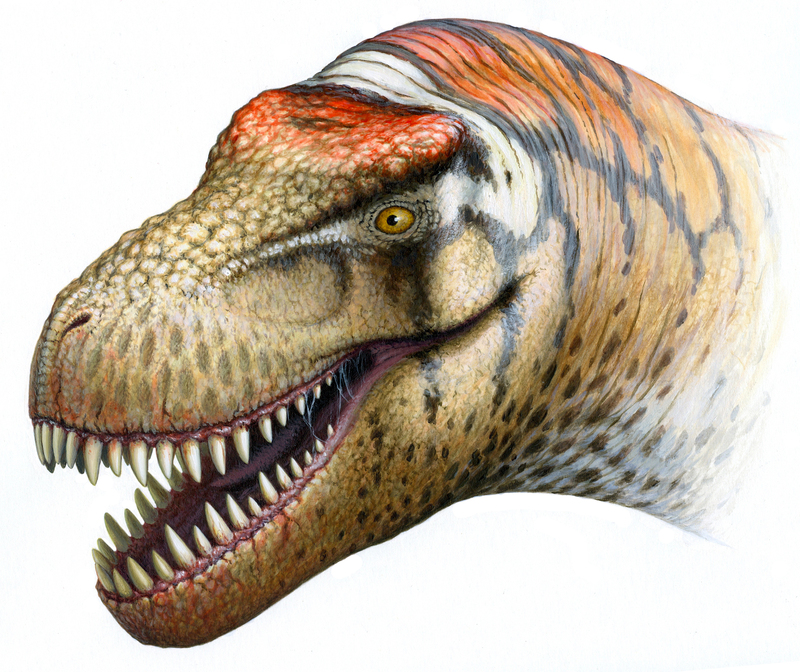 And if really like this, go do a Google image search for ‘Zhuchengtyrannus’, it’s quite startling. I have my longtime Musings friend Bob Nicholls to thank (well, we did pay him too) for the superb art of Zhuchengtyrannus that has accompanied the release of this work into the media. The original and Bob’s pencil sketch will soon hang proudly on the wall of my office (they’re being framed right now). What Bob has produced is, I think, quite beautiful, but there are a couple of features in there which the sharp-eyed (or overly nit-picky) may have spotted that are worth discussing as they illustrate some of the issues of producing such a work and how things can be done to highlight certain issues or produce an effect for the reader. While much can, and has, been written and discussed about the various aspects of palaeoart (or palaeontography if you prefer) this is a nice opportunity to go a little further. First off there is one too few teeth in the dentary. This is basically my fault (or if you want to be more generous to me, that of the authors collectively). 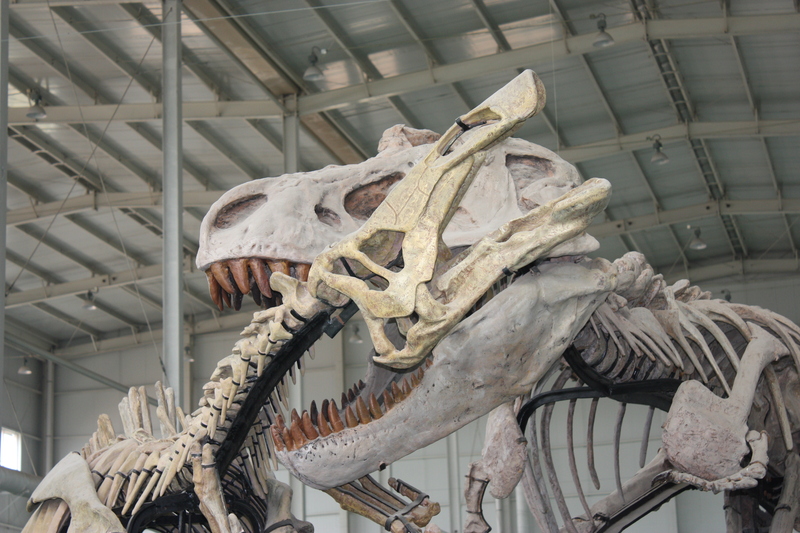 We originally misinterpreted the broken small tooth socket at the front of the dentary, that many tyrannosaurs have, as being part of a very large first tooth. That is, the first and second sockets were smushed together and we thought they were just a single large one till a referee correctly spotted this error and we corrected it in the paper. By this point Bob had already turned in his work and it was too late to do anything about it. To be more accurate, we never told him! So if you’re reading this now Bob, feel absolved of any blame, but I didn’t tell you because I felt guilty and didn’t want you to have to go to any trouble to correct it and assumed that no-one would know or care (though I’m rather destroying the first notion by writing this). Of course, if anything the teeth are too correct in that (first dentary tooth apart!) they are all there. Theropods shed their teeth quite regularly and it would be normal for one or two to be broken or only half exposed in the jaw rather than a nice neat row as seen here. This of course introduces the main point I wanted to make in this post: this artwork (like many others) is supposed to be illustrative. It’s created to communicate something about the animal as a living organism to people based on the fossil bones. Many people seeing this would likely be hindered, not helped, by such details and would be wondering why the teeth were uneven and oddly positioned. This artwork, (with the Musings being the only likely exception) will not be accompanied by expert commentary on theropod anatomy and physiology and was destined for consumption by the general public so keeping things simple was the order of the day. (Though for the record, Bob and I never discussed this, his draft had the teeth like this and I thought it fine to keep them like that). 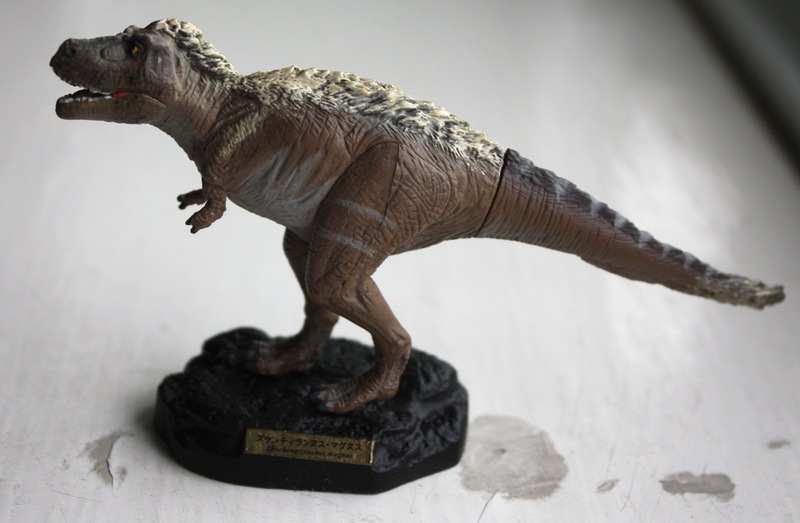 Similar to this, the sculpting on the maxilla (seen here) is particularly prominent, and while this is a common feature of adult tyrannosaurines, to my eye at least, it’s a little bit more pronounced than I’ve seen in other tyrannosaur specimens. As such I asked Bob to emphasise this in the artwork. In reality, the muscle and fat layers and even the skin itself were probably thick enough that looking at the living animal this would be invisible, or at least rather more subtle than seen here. But again, the point here was to emphasise a characteristic of the bones in the art – to provide an obvious point of reference for someone who knows nothing of dinosaurs to make the connection between the bones and the life reconstruction. I can see that not everyone might be happy with this. But my take would be that you have to tailor the picture to the audience and the level of information that can go with it. In emphasising the sculpting and keeping the teeth regular there is nothing especially odd or outlandish about this. It is accurate and reasonable (plausible if not probable if you like) and deviates only a little from what you might consider a perfectly accurate or perfectly probably reconstruction (this after all, is not what a human looks like – it’s informative, but not necessarily realistic as such). If I were to get this done for a dinosaur book where I could wax lyrical over several pages or include key notes and labels then I’d probably actively want to add missing teeth and reduce the sculpting to emphasise these very points, but in the circumstances this was the best way to convey the maximum information with the minimum amount of confusion. OK, I admit there’s not actually too much to say about this, but what little there is, is quite important. Zhuchengtyrannus is really rather big – a little smaller than Tyrannosaurus, about the same size as Tarbosaurus and thus as a theropod perhaps bigger than anything except these two, Spinosaurus, Mapusaurus and Giganotosaurus (and more coming on that tomorrow). It was certainly a serious customer. More boringly, in a way, Zhuchengtyrannus is really quite a normal large tyrannosaurine –the anatomical differences are sufficient for taxonomic purposes but would probably make no real difference to the overall appearance of the animal – that is, as far as we can tell it would look in life very much like Tarbosaurus and Tyrannosaurus. While there isn’t that much of it, what we have is quite normal and it’s reasonable to infer that this animal was occupying a similar niche to the other giant tyrannosaurines (and that means predation and scavenging). That is in itself a bit of a novelty. As I’ve noted before when discussing spinosaurs, it’s actually quite common to find multiple, similarly-sized large theropods in the better-known dinosaurian faunas. We find Allosaurus, Torvosaurus and Ceratosaurus together, Sinraptor and Monolophosaurus, Charcarodontosaurus and Spinosaurs and so on. 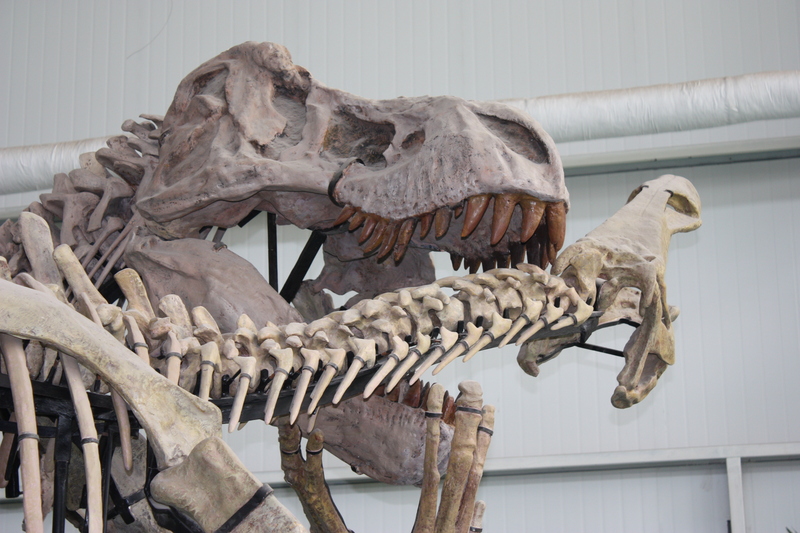 Even when it comes to tyrannosaurines we find the smaller Daspletosaurus and Albertosaurus together (not to mention our old favourite Gorgosaurus). 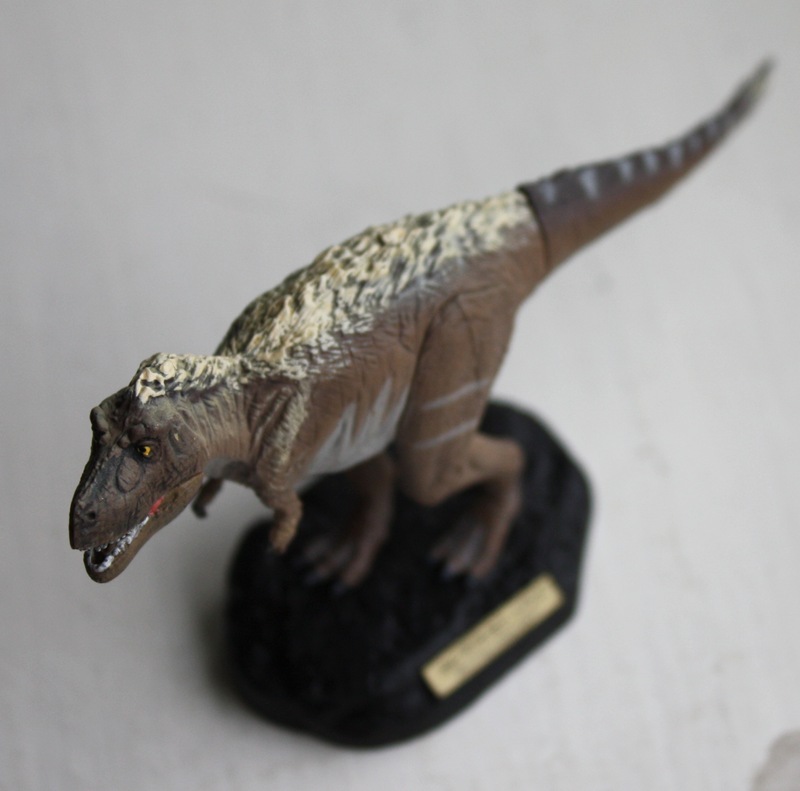 However, Tyrannosaurus seems to have lived alone as it were (and you can argue Nanotyrannus, but it’s quite a bit smaller) and Tarbosaurus may not have been really troubled by Alioramus. While we have no direct evidence that Tarbosaurus and Zhuchengtyrannus overlapped directly their fossils are being recovered from very similar times and only a few hundred kilometers apart. It’s really quite likely that they met and of course ZT is itself accompanied by another large tyrannosaur from the same quarry so there could have been quite a party going down. To employ a much overused phrase, this does rather leave T. rex as the exception that proves the rule – it’s increasingly looking like the only big theropod which doesn’t come with at least one accompanying near-equally sized alternate carnivorous theropod. Despite the ever increasing similarities between the Late Cretaceous faunas of North America and Asia, T. rex does still seem to be, in at least one way, still the undisputed king of his own backyard. After the quick intro to the new taxon, now it’s time to talk in a bit more detail about the bones of Zhuchengtyrannus. All we have is a maxilla and a dentary but that’s actually quite useful. A few ribs and some caudal vertebrae wouldn’t have told us much as these are rather conservative in tyrannosaurs, but happily maxillae are not and have lots of useful and important taxonomic characters in them. 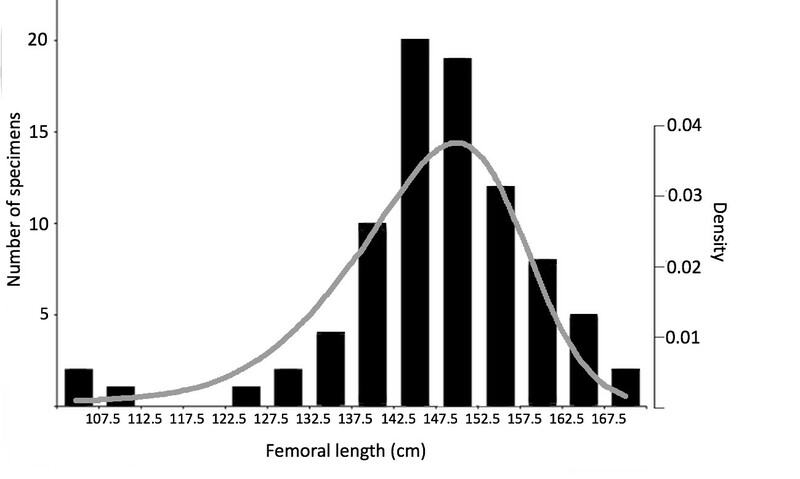 It is also worth remembering that pretty much any bone, or even part of one, that is diagnostically different from everything else out there is reasonable to use as the basis for erecting a new taxon (like Brontomerus and various others). 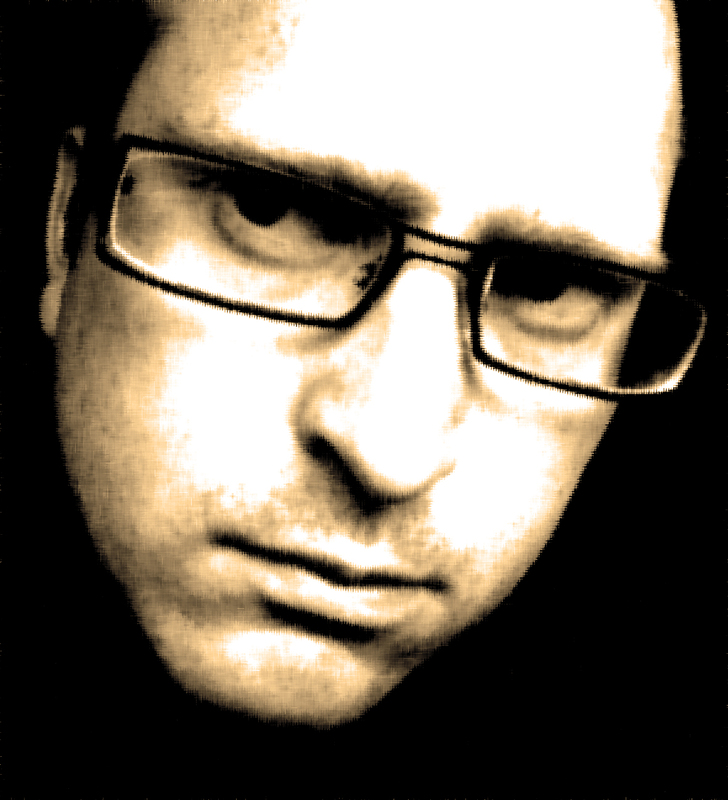 I should of course add, before I go much further, that this is a blog, not a paper. There is more detail and commentary in the actual publication than here in internet land and if you really want to dive in then go read the paper (though again the paper as it stands online is an uncorrected proof, and that has cut off part of the taxonomy stuff!!!). This here is little more (as ever) than a surface discussion of the issues for general consumption and if anything more general than normal as I hope (expect?) that a few more people than normal will be finding the Musings right now as a result of the media coverage. For those that don’t know their tyrannosaur taxonomy as well as they’d like it’s worth noting that Zhuchengtyrannus is a tyrannosaurine and that puts it in the group of especially large and derived tyrannosaurs and as part of a Late Cretaceous group that was restricted to eastern Asia and North America. We can tell this at least in part because it is a huge theropods from the end Cretaceous of China, but the relatively straight anterior edge of the maxilla supports this, and the shape of the teeth and dentary put it well within the tyrannosaurs in general. At this juncture, it’s worth remembering that there are different ways of identifying species, or more specifically, distinguishing them from others. Obviously with a fossil we’re working on a morphological species concept (that is, identifying a species buy it’s anatomy), but more specifically we can separate out differences in different ways. 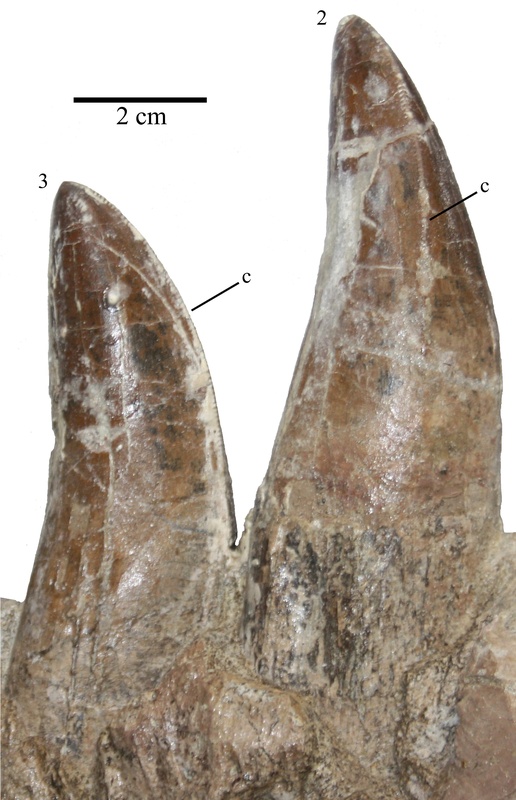 First off we can look for genuinely unique features – a giant tooth in socket 5, only one finger on the hand, a skull twice as long as tall etc. Things that appear in our new species that don’t appear in any others (or at least any other close relatives – stripes are characteristic of tigers since even though other cats are stripey, you’d never confuse the two because of the obvious size differences etc.). Secondly though, you can look for unique combinations of characters. One species may have a long and wide skull, another a short and narrow skull. The characters of ‘long’, ‘short’, ‘wide’ and ‘narrow’ are all in play here, but you could distinguish a possible new species with a clearly distinct combination of ‘long and narrow’ or ‘short and wide’. So onto Zhuchengtyrannus. 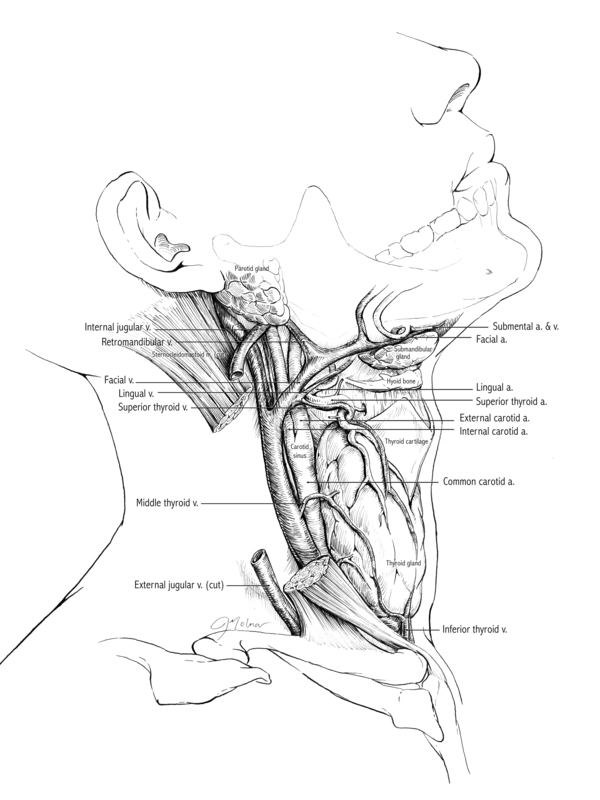 This is diagnosed in our paper by two unique characters – a short of shelf on the anterior part of the maxilla and an odd notch in the maxillary fenestra (see figure below). 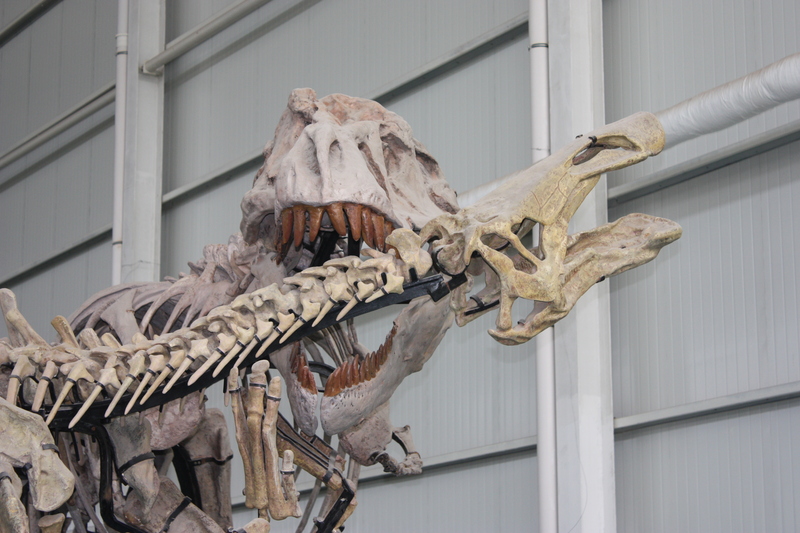 Neither of these does, to our knowledge (or indeed that of the referees or various other colleagues we consulted), turn up in any other tyrannosaur specimen ever. There is also a unique combination of characters to further separate it from other tyrannosaurs in the position of the antorbital fossa and size of the maxillary fenestra. Although the specimen was not entirely complete when recovered (and sadly the maxilla was later damaged as can be seen from the picture of the maxilla in the previous post) it was initially in very good condition. We have good reason to think therefore that all of these characters are valid ones. The bones were not broken (well they are a bit, but not where the critical characters appear) or distorted or altered and there was no sign of disease or pathologies. This is also not an issue of ontogeny (age-related changes). The animal is easily big enough that it’s hard to credit that it was anything other than an adult, and possibly a large one at that. 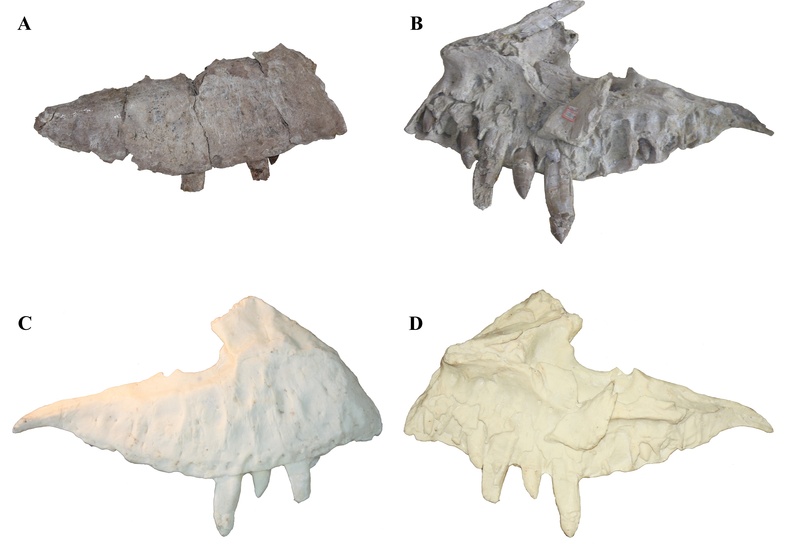 Moreover, there is a decent literature on both ontogenetic changes in tyrnanosaur skulls and on intraspecific variation. Zhuchengtyrannus exhibits several characters that are normally only seen in adult tyrannosaurs (like the heavy sculpting on the maxilla, more on that later) and the characters we use in our diagnoses are not known to vary either through growth, or within putative populations. For all of this, lumping taxonomists out there might well not regard this as valid (“To synonymy, and beyond!”). There are those who would still have Tarbosaurus as ‘just’ a species of Tyrannosaurus and I can only suspect they won’t like this much as a result (though I don’t know for sure of course). All I can say is that we are happy with the distinctions, and the referees and other colleagues who have examined the material were too. Taxonomy really does operate at little more than a consensus level and while this can all change, already (from what I have seen and discussed so far) the consensus is that this is a perfectly valid taxon. Of course there’s also a good chance that we will get more material of this species (indeed as noted previously, we may already, even if referral is currently an issue) which will help our cause. Given what bones we currently have, Zhuchengtyrannus seems to be as diagnostic as any other large tyrannosaur and while it could be better (we don’t have that much material), it is sufficient. 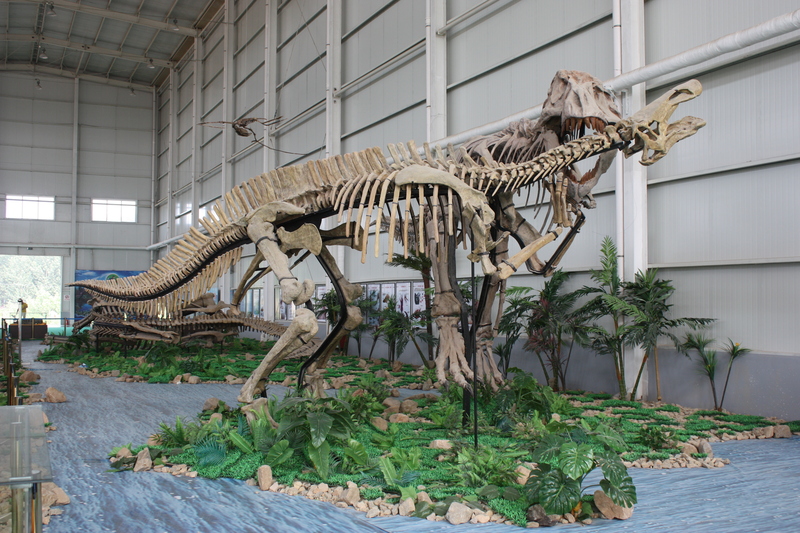 Even so, this is only the second tyrannosaurine from China and one that very probably overlaps in time, and space, with Tarbosaurus. As such, it is worth making special note of the differences between these two and again there are some more in the palatal shelf and at the back of the maxilla. In short, it should be very hard to confuse the two if you have a maxilla of either in your hands and there is even better reason to think the two are different and thus again that Zhuchengtyrannus is a genuinely new genus. I was also reminded in comments in yesterday’s post about ‘Tyrannosaurus zhuchengensis‘ which is detailed in the paper, but initially forgotten here! Whoops. 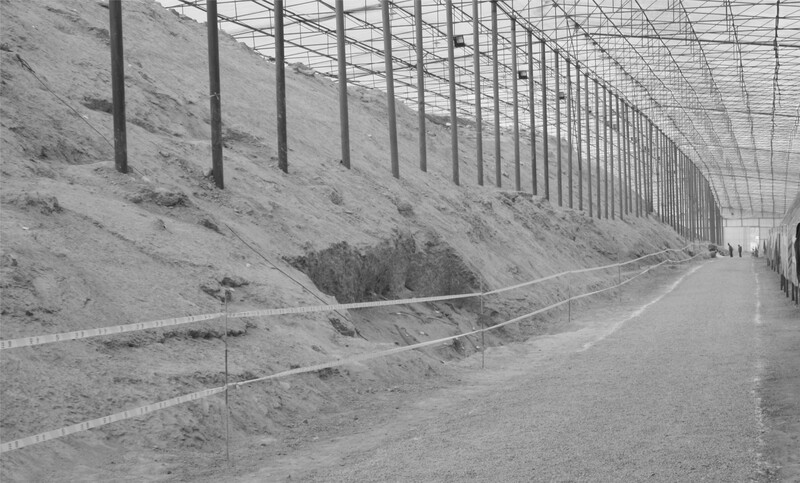 back in the 1970’s several tyrannosaurus-like teeth were recovered from this quarry and, in the manner of the day, named as a new species: Tyrannosaurus zhuchengensis. Later on a single isolated metatarsal (foot bone) was assigned to this species. What of this? Well none of these teeth or the metatarsal show any unique features that would make them diagnostic from any other tyrannosaur – in short, if you got a Tarbosaurus or Tyrannosaurus tooth or metatarsal and compared them to the T. zhuchengensis material, you wouldn’t seen any real difference. As such we cannot consider this to be valid and we therefore call Tyrannosaurus zhuchengensis a ‘nomen dubium’ – a dubious name that should never have been created and should no longer be used (and hence the use of quote marks around it in it’s initial appearance here). Of course this material might be a much earlier record of Zhuchengtyrannus, but we can’t be sure, it might belong to the second taxon, or who knows, even another tyrannosaur! That’s rather more than I intended to say so I’ll cut it ‘short’ there. More to come tomorrow where I’ll delve into the ecology of ZT and then we’ll be onto the glorious artwork and its genesis and importance in science communication.